Pinterest is a little app of joy where I have spent many hours pinning many MANY inspirations. Some ideas I’ll get up and put in to action straight away, some I’ll probably never do, but the fact I have pinned it to a virtual board means I am at least one step closer. Right? This Card Organiser I’ve had pinned for well over 5 yrs! always with the intention I will do it…..one day. That one day was today. I’ve done it. Finally! What is the point I hear you say? – well, have you ever been in a situation when you’re about to go to a party, you’re all dressed up, ready to leave the house and then it dawns on you….you haven’t got a card to take. You pop to a shop on the way, buy a card, get in the car to write it, realise you have no pen, go back in shop, buy a pen, write card and arrive to the party late. Surely that hasn’t only happened to me? – that’s how The Card Organiser has your back covered for any occasion. Because you will always have a spare card on hand and you will arrive at the party on time. Hopefully. It’s worth a try. Just as long as you remember to keep it well stocked of course. Have I sold the idea to you yet? One last sales pitch….it’s an excuse to buy a brand new folder, use some pens, stickers and get your craft on. The feeling of satisfaction at being organised is a bonus. You can also then go out and buy some pretty cards to stock it. I like to keep an eye out at local markets and bargain shops, you can pick up quality cards for a little as 25p each or even some have offers like 7 for £1. So with this project you could also save a lot of money because you won’t be rushing to buy a card from the supermarket, paying a premium price that makes your purse weep. You want it now, yes? I used a folder I found in Tesco. I think it was about £2. 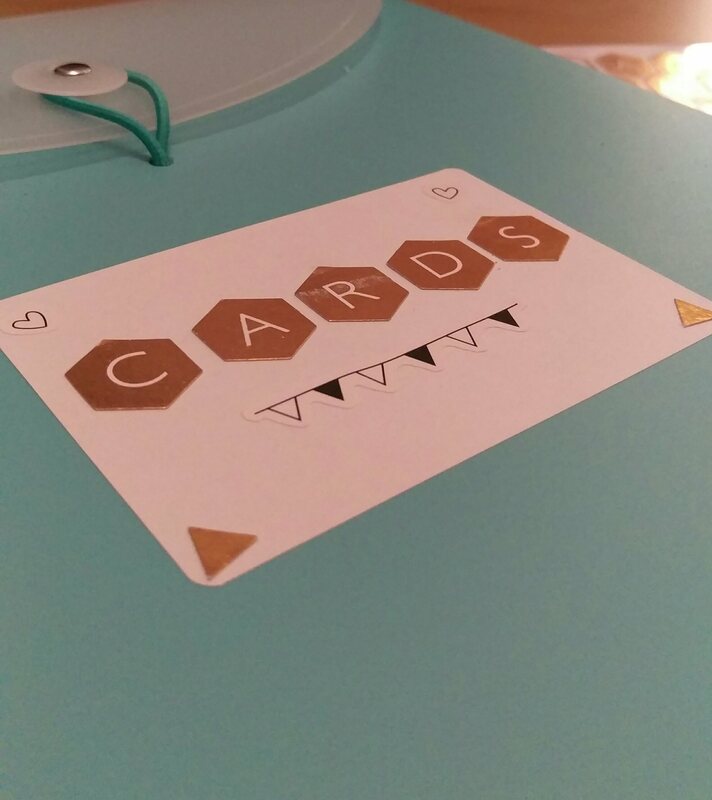 I liked the orientation of it, it is sturdy, flexible enough to fit plenty of cards and I love the colour (Unfortunately I can’t find it on their website to link it to) – I decorated the front with some copper sticky letters which I bought for £1 in store at the Craft Warehouse which is little piece of craft heaven. If you’re local to Rushden I highly recommend you visit. They have lots of craft demos, craft workshops, an abundance of every craft supply imaginable and even a cafe – what more could your heart desire? That’s all I needed.. It took all of 10 minutes to do and now all my cards are in one organised place. Job done! I’d love to know what you think? are you going to make one? Lots of love to you all for now. I wish you a fabulous weekend. I’ll be back soon!